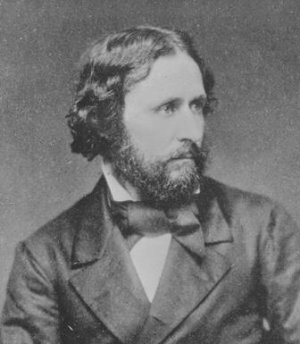 John Charles Fremont was a controversial figure in the early struggle for Missouri during the American Civil War. President Lincoln appointed Fremont as the Commander of the Western Department on July 3, 1861. On August 30, 1861, Fremont issued an emancipation proclamation that declared martial law and freed the slaves in Missouri. This controversial act and his inability to pacify Missouri led to his removal from command by Lincoln on November 2, 1861. J ohn Charles Fremont was born in Savannah, Georgia on January 21, 1813.On October 19, 1841, Fremont married Jessie Benton, the daughter of Missouri Senator Thomas Hart Benton. Senator Benton was an ardent supporter of westward expansion and was able to have Fremont appointed to lead several expeditions of western exploration. Using Kit Carson as his guide in the 1840s, Fremont led expeditions over the Oregon Trail into the Sierra Nevada. In 1845, Fremont and Carson led an expedition into California. In California at the outbreak of the Mexican-American War, Fremont was appointed as the Lt. Colonel of the California Battalion of U.S. Mounted Rifles. At the end of the war, Fremont was made the Military Governor of California. However, Brigadier General Stephen Watts Kearny had orders from President James Polk naming Kearny as the Military Governor of California. Fremont refused to relinquish his position. Kearny had Fremont arrested and taken to Washington for a court martial. Fremont was convicted, resigned his commission, and returned to California. California was admitted to the Union as the 31st state on September 9, 1850, and Fremont was one of the first Senators to serve. 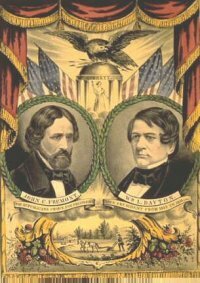 In 1856, Fremont was nominated to run for President of the United States by the newly formed Republican Party. He came in second to James Buchanan. After Lincoln's election victory in November of 1860, war seemed inevitable and his supporters, including Postmaster General Montgomery Blair, lobbied for Fremont to be nominated as the new Administration's Secretary of War. But Fremont was unavailable, having prior commitments to be in Europe on business. When the war broke out in April 1861, Fremont immediately made plans to return to the United States and offer his services to the Union. Using his own money, Fremont purchased $200,000 of arms and ammunition and arranged for it to be shipped back to the United States. Fremont arrived in Boston, Massachusetts on June 27, 1861 and headed for Washington, D.C. to meet with President Lincoln. On July 3, 1861, Lincoln named Fremont to be commander of the newly created Western Department. 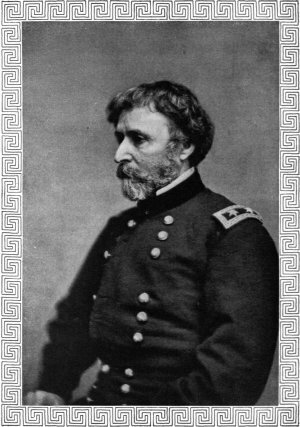 Major General John Charles Fremont's headquarters would be in St. Louis, Missouri. Fremont's plan for the west was to move down the Mississippi River and capture Vicksburg, Mississippi and then move on and capture New Orleans, Louisiana. This would split the Confederacy in two and secure the Mississippi River for the Union. Lincoln would leave the details of winning the war in the west to Fremont telling him, "I have given you carte blanche; you must use your own judgment and do the best you can." Fremont went to New York to pull together a staff and set about getting supplies for his forces in the west. He would find this difficult to accomplish for the western theater did not receive very much attention from Union officials in Washington, D.C. In the end, Fremont would recruit foreign-born soldiers for his staff and personal bodyguard. He ended up leaving for St. Louis on July 21, 1861. When he arrived there, four days later, on July 25, 1861, Fremont found that his forces were scattered across the Western Department. The fighting had already begun, and his forces were "ill-equipped, ill-trained, and ill-organized." The struggle to save Missouri for the Union was well underway, and Fremont did not feel he had the resources to succeed. Union Brigadier General Nathaniel Lyon was in Springfield, Missouri, outnumbered by a coalition of Southern forces under the command of Confederate General Benjamin McCulloch (see the Battle of Wilson's Creek). A large Confederate force under the command of General Gideon Pillow threatened Fremont's southern flank in southeastern Missouri. He immediately began requesting additional resources from Washington. He was assisted in this by his wife, Jessie, a strong-willed woman who was the daughter of former Missouri Senator, Thomas Hart Benton. "I believed him to be a man of great activity and promptness in obeying orders without question or hesitation. For that reason I gave General Grant this important command at this critical period. I did not consider him then a great general, for the qualities that led him to success had not had the opportunity for their development. I selected him for qualities I could not then find combined in any other officer, for General Grant was a man of unassuming character, not given to self-elation, or dogged persistence, and of iron will." Unfortunately for Lyon's Army of the West, outnumbered 2 to 1 near Springfield, Missouri, Fremont would not be able to send either reinforcements or additional supplies. Although recruits were showing up by the thousands, there was no time to train them. On August 6, 1861, Fremont sent word for Lyon to retreat, although Fremont did give his commander discretionary orders to fight if practicable. Receiving these orders on August 9th, Lyon called his officers together for a council of war. Although the consensus was for retreat to Rolla, Missouri, Lyon decided against retreat and moved forward to attack the Southerners on August 10th. Lyon's defeat and death at the Battle of Wilson's Creek probably marked the beginning of the end for Fremont in Missouri. Buoyed by the Southern victory at Wilson's Creek, guerrilla activity against the Union surged in Missouri. Previously supporters of Fremont, Montgomery Blair and his brother, Missouri Congressman Frank Blair, now began to lobby for Fremont's removal as commander of the Department of the West. "All persons who shall be taken with arms in their hands within these lines shall be tried by court-martial, and, if found guilty, will be shot. The property, real and personal, of all persons in the State of Missouri who shall take up arms against the United States, and who shall be directly proven to have taken active part with their enemies in the field, is declared to be confiscated to the public use; and their slaves, if any they have, are hereby declared free." By issuing his "emancipation proclamation" for the State of Missouri, Fremont immediately became a "poster child" for abolitionists in the North. However, this action went directly against Lincoln's policies meant to keep the "border" states of Missouri, Maryland and Kentucky in the Union. On September 2, 1861, Lincoln send a letter to Fremont asking him to revise the proclamation and remove the part that freed slaves in Missouri. Fremont replied to Lincoln that he would only make the change if Lincoln publicly ordered him to do it. His wife, Jessie, would take his reply and deliver it directly to the President. Her meeting with Lincoln did not go well. Meanwhile, back in the Western Department, the war was not going all that well for the Union. On the positive side, Brigadier General Ulysses S. Grant had seized the strategic port on the Ohio River of Paducah, Kentucky. But in Lexington, Missouri, a Union garrison of 3,500 had been forced to surrender to the Missouri State Guard under the command of Major General Sterling Price. Fremont had been unavailable to send reinforcements to support the Union forces in Lexington. Lincoln decided to act by sending his Secretary of War, Simon Cameron, to St. Louis to investigate Fremont and decide whether to retain or remove Fremont from command. Cameron met with Fremont and decided to give Fremont one more chance. Knowing his future was at stake, Fremont decided to take to the field and lead his own army of 40,000 southwest to take back Missouri. Hopelessly outnumbered, Major General Sterling Price withdrew his Missouri State Guard from Lexington, Missouri and headed south. Fremont kept after Price. On October 25, 1861 in Springfield, Missouri, a combined cavalry force of Prairie Scouts and Fremont's Body-Guard numbering about 300 under the command of Major Charles Zagonyi attacked and defeated a force of 1,500 Missouri State Guard under the command of Colonel Julian Frazier. Zagonyi withdrew from Springfield and rejoined Fremont's army, which later moved in and encamped near Springfield. On November 2, 1861, a messenger (Brigadier General Samuel R. Curtis) from President Lincoln arrived at Fremont's camp. The messenger had orders that Fremont was to be replaced as Commander of the Western Department by Major General David Hunter. Fremont's grand plan for victory in the south was now discarded. John and Jessie Fremont returned east. There was a Congressional investigation into the affairs of the Western Department after which Fremont was exonerated of all charges. In the spring of 1862, Lincoln appointed Fremont as the Commander of the Mountain Department of Virginia, Tennessee, and Kentucky. Fremont's forces would suffer a series of defeats against Confederate General Stonewall Jackson in Jackson's Valley Campaign. On June 26, 1862, Lincoln created the Army of Virginia and appointed Major General John Pope as its commander. Fremont's Mountain Department became a part of the Army of Virginia and Fremont now reported to Pope. Fremont and Pope had long been fierce rivals, and Fremont felt he could not serve under Pope. Fremont requested that Lincoln relieve him of his command, and Lincoln granted his request. Fremont spent the rest of the war waiting for a new command that never came. Fremont was nominated by the Radical Republicans to run for President in 1864, but dropped out of the race in September of 1864. Fremont briefly owned the Southwest Pacific Railroad after purchasing it from the State of Missouri in the winter of 1866. The State of Missouri repossessed the railroad in June of 1867 when Fremont defaulted on his second payment. Fremont served as Governor of the Arizona Territory from 1878 through 1881. Fremont died in 1890 in New York City. He is buried in Rockland Cemetery, Sparkill, New York. Denton, Sally. Passion and Principle: John and Jessie Fremont, the Couple Whose Power, Politics, and Love Shaped Nineteenth-Century America New York: Bloomsbury USA, 2007.